If you tried asparagus as a child and did not like it, give it another shot. As we get older, our taste buds become less sensitive to the slightly bitter flavors found in many vegetables. To minimize the strong flavor that sometimes appears when asparagus is overcooked, steam, roast, grill or microwave asparagus just until it is tender and still bright green. Asparagus is excellent when added to an egg dish, casserole, salad, stir fry or soup. Asparagus is low in calories and sodium and has no cholesterol. It contains many nutrients including calcium, magnesium, zinc, copper, beta-carotene, iron, phosphorus, folacin, thiamin, fiber and vitamins E, K, C and B6. The amino acid asparagine gets its name from asparagus because it contains a good amount of it. Friendly bacteria in our gut feed on substances in asparagus that aid our digestion. 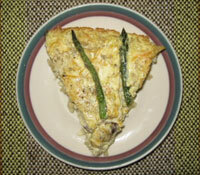 The rice crust cuts down on the total fat and trans fats usually found in quiche recipes. Asparagus is picked when temperatures are cool, so the best time to buy it is during early spring. Young shoots of asparagus are the edible parts. The bottom portion of asparagus shoots usually contains sand and dirt, so thoroughly wash them before cooking. Combine brown rice, 1/2 cup egg substitute and 1 tablespoon reduced-fat margarine in a medium bowl. Press rice mixture into 9-inch pie plate sprayed with non-stick spray. Sauté mushrooms in oil until lightly browned. Using a slotted spoon, remove and set aside. Rinse the skillet, and fill with water to a depth of about 2 inches. Bring water to a boil; add trimmed asparagus. Cook for about 4 to 5 minutes, or until just tender. Sprinkle 1/4 cup cheese and mushrooms over bottom of rice crust. Arrange asparagus spears in a spoke fashion over mushrooms in an even layer. In the medium bowl, lightly beat 3/4 cup egg substitute with fat-free half and half, lemon peel, juice, herb-spice mixture and pepper. Pour over vegetables. Set the pie on a cookie sheet in a preheated 350° oven. Bake for 45 minutes or until knife inserted comes out clean.